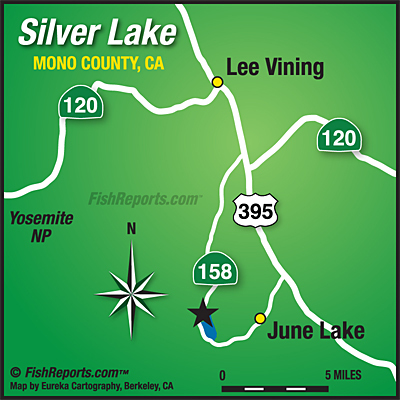 Silver Lake Resort 760)648-7525. Wow! I'm looking at the Resort's big fish book seeing oodles of Oregon Rainbows from 2 to 6 plus lbs being caught from shore and boat using the typical baits and lures. Why? Silver Lake Resort has had plants of these big fish going all the way back to last year including last week and another next week. The bite at Silver should remain great through the end of the season. Dig this: Steve from Anaheim weighed in a 15 lb. plus stringer. Really dig this: Debra from Campo brought in a 27 lb. plus stringer including one tipping the scale at 7lb.-6oz. Wow again! Remember, when fishing floating baits here use at least 5' of leader. I go with this length in all The Loop lakes. The Resort will be closing 10/15 however the lake will remain accessible including the Forest Service campground and boat ramp.